We could graduate tomorrow and still not get a theme in the next two years. If you don't believe me, check the list of the latest sites to have graduated. As you can see of the last 11, only two have themes. However, it is possible with the use of some scripting to design a theme ahead of time. That way we can bounce ideas and make it look pretty ahead of time. So far I have a proof of concept script up and have made three small changes, adding a border to the tags, changing the color of the questions and changing the upvote icon on upvoted post to a green tree icon that I found for free. Probably more things I haven't thought of. This won't change anything for anyone who doesn't have the script running. Let's host the icons with imgur just like all of the other images. If you want to contribute to the Github repo, I believe that I just need your Github username to add you. Let's do the feature request branch style, with all changes to master being done with pull requests. This is my first Tampermonkey script ever, I probably messed something up somewhere. Sorry to be a wet blanket, but I don't like fancy stuff, because fancy stuff gets boooring very quickly. Uparrow and Downarrow are fine with me. How about we work on getting more questions per day and increasing our answer ratio so we can get out of beta and get our site launched? Then we can have a genuine site theme instead of trying to come up with a work-around and pretend we're launched. 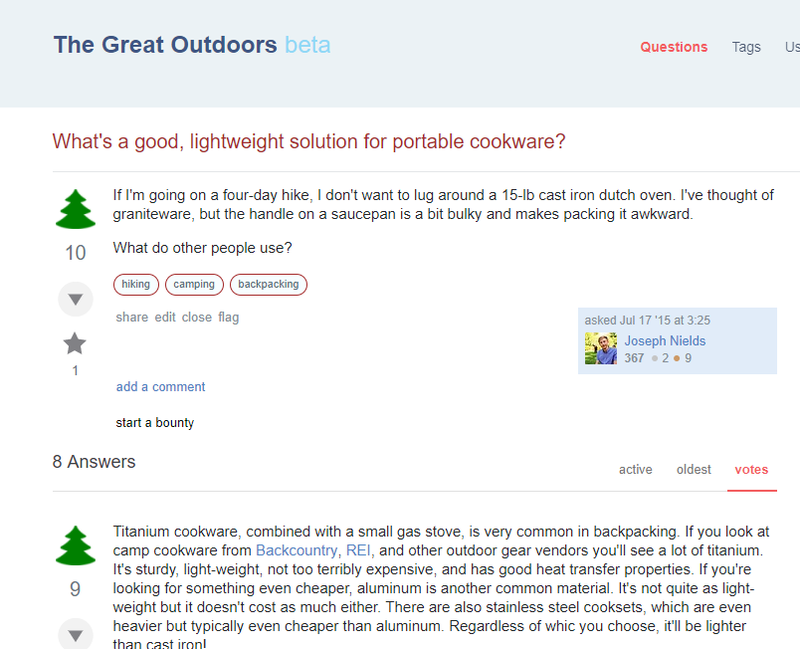 If we got 10 people to commit to posting one question per day (even if they are bad questions) then we might at least fake our way out of beta eventually, and get a site design. If you open the door to manufactured items like 'carabiners' then you set a foundation for others like knives and guns that will lead to politically charged debates. IF customizations are used, they should stay more Earth based as opposed to Human made.